Click here to view samples pages from the Virginia Redbook. What to do when there is a lease violation? How the eviction process works? We found bed bugs. Now what? How does the Service Members Civil Relief Act affect us? What if one publication could answer it all? 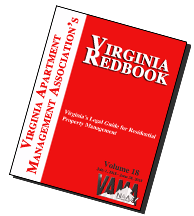 Introducing VAMA's Virginia Redbook! Virginia's only legal guide designed exclusively for multifamily rental housing owners and operators. In this business legal questions abound, and no other organization better knows the challenges multifamily owners and operators face; that is why we have designed the Virginia Redbook. Your time is expensive! Start saving money now and increase your NOI by bringing the legal information you need to know directly to your finger tips. Don't wait! Order your copy today! Special Discount available for VAMA/NAA Lease Program users! See Details. INVOICE ME Hardcopy Purchase: Purchase hard copies of the publication priced at the INVOICE ME price of $95/book. (Extra discounts available for users of the VAMA/NAA lease, powered by Bluemoon Software.) Books shipped after payment is received. INVOICE ME Download License Purchase: Purchase a reproduction and distribution license and download to an iPhone, iPad or your company's intranet for unlimited distribution within your company at the INVOICE ME price of $85/300 units. (Available for management companies only. Extra Discounts available for users of the VAMA/NAA Lease, powered by Bluemoon Software.) Download available after payment is received.